At the Peace Plaza in Olympic Park located Songpa-gu, Seoul, a walkathon for world peace took place on April 22, Sunday. About 10,000 members gathered, wishing for the happiness of children all around the world. 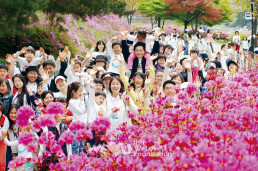 Under the slogan, “Mother’s Love to the Whole World,” the 9th New Life Family Walkathon was hosted by the New Life Welfare Foundation and was sponsored by Ministry of Health and Welfare, Seoul Metropolitan Government, Commission on Youth Protection, Korea Association for the Prevention of Child Abuse Network [KAPCAN] and Bucheon Sejong General Hospital. The New Life Walkathon has been held in order to deliver new life and hope to parentless households and children suffering from heart disease and rare diseases. As the walkathon was held year after year, its helping hand reached far; not only Korean children but even Vietnamese children with heart disease were supported. The 9th Walkathon, especially, delivered love to children in six countries: Ghana, DR Congo, Peru, Brazil, Mongolia and China. Foreign diplomats in Korea also attended this meaningful event including Urjinlhundev Perenlei the Ambassador of Mongolia in Korea and John Bosco Dery the Counselor of the Ghana Embassy in Korea. And many domestic guests also attended the walkathon: Lee Bae-geun the Principal of Korea Youth Counseling Institute, Lee Bong-hwa the Supervisor of Woman & Family Policy Affairs of Seoul City, Jeong Yeon-bo the Secretary-General of Seoul Council on Social Welfare, Lee Tae-hyeon the Head of Bucheon Sejong General Hospital, Actor Kim Bo-sung (who is an PR Ambassador of the New Life Welfare Foundation), and Vocalist Lee Seung-hun. The members are walking joyfully along the promenade full of flowers. Over 10,000 members fill the Peace Plaza. After the ceremony, the walkathon started. The members walked along the lake with their families, enjoying sweet scent of spring flowers among evergreen trees. A rabbit in the grove, ducks in the lake and cartoon characters were all interesting and marvelous to the children who attended with their parents; and they didn’t forget to think about their sick neighbors and wished them to get better soon. After the members completed walking, they returned to the Peace Plaza and had lunch together with their families. After lunch, the “Festival to Share Love” was held; the New Life Children Choir sang children songs with dance, and the vocalists, who were also foundation members or the PR Ambassadors, sang songs with all their heart. After all the official programs, there was a time for family gathering: making button for smile families, rope-jumping, traditional games and so on. At the booth named “Message of Hope” for the children suffering pain throughout the world, children filled the world map with their encouraging messages in neat hand writing. Moreover, it was really touching that they participated in “Relay to Deliver a Mother’s Love” as the last program. It was specially arranged to educate children to become considerate of their neighbors in need and share their goods with others; children donated their precious goods for children in remote islands in Korea or overseas. Boys brought their balls and toys, and girls willingly brought their dolls which they received as their birthday presents. Many children brought their school supplies such as pastel crayons, pencils and notebooks. 9-year-old Gang-san brought his new watch that his father bought him and hoped that it would give joy to someone. 6-year-old Ji-su was delighted, saying, “I’m happy to give my pastel crayons to a friend who needs them.” They already understood that they are happier when they give love than receive. The members hoped that they would help children worldwide with a mother’s heart, saying, “It is a mother’s heart to want to give something precious to others.” PR Ambassador Kim Bo-seong said, “A mother’s love is sacrifice and devotion. I think today’s event is much more beautiful because its purpose is to deliver a mother’s love to the world. I wish children, the leaders of the future, to live with hope through this love.” Becoming one with the love of a mother, the members will continue to deliver the love to global neighbors beyond national boundaries.